Please note some menus differ across restaurants. For specific menus click on Locations and choose your Fazenda. Your Fazenda experience begins with a visit to our gourmet sides bar that features quality salads, fresh cut vegetables, breads, cured meats, continental cheeses and hot dishes, including our traditional Brazilian Feijoada (bean stew with meat). Once you are ready for the meats, you control the service with a small double-sided card placed on your table. The green side signals the chefs to bring out skewers of sizzling meats one by one, while the red side indicates a resting point. To resume the service, simply display the green side again. Use the card to control the service to your own pace. There is a large selection of meats and the beauty is you can have them all. Picanha Pea-CAN-ya Cap of Rump Our signature cut; delicate, juicy and full of flavour. Alcatra Rump Tender cut with a distinctive meaty taste. 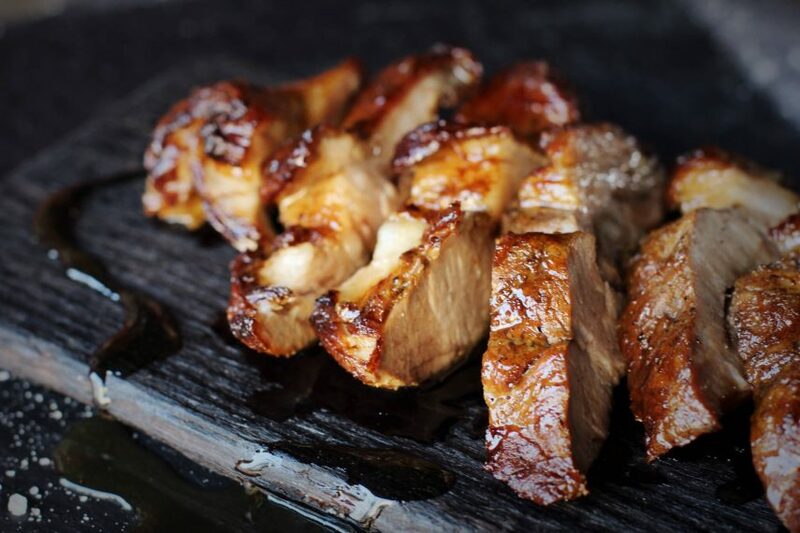 Barriga De Porco Pork Belly Sliced and served with honey and cinnamon sauce. CORAÇÃO DE FRANGO Chicken hearts Traditionally Brazilian, give it a try! FILÉ-MIGNON Beef Tenderloin Succulent, tender and lean. FRALDINHA Beef Skirt Flavourful, juicy and marbled with fat. Our Butcher's Choice A special cut of meat carefully selected by Fazenda’s butcher. 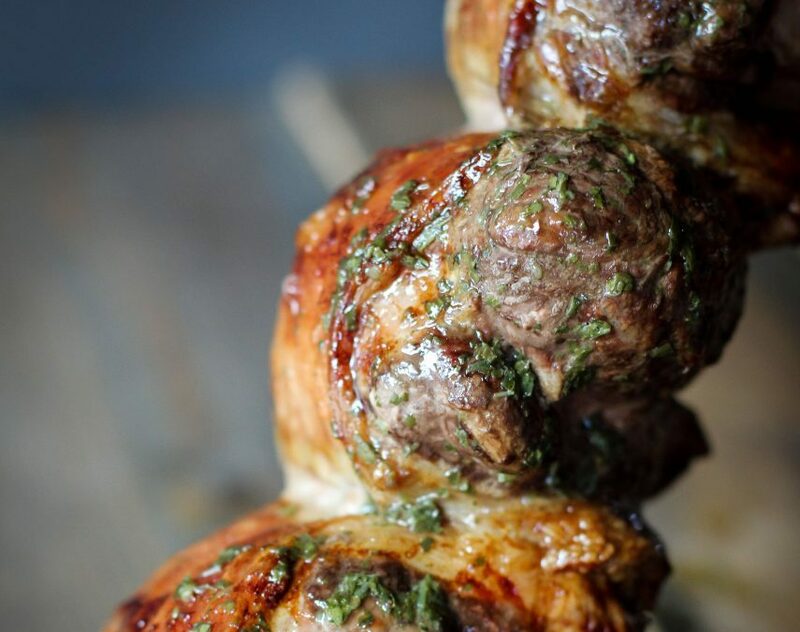 At Fazenda we cater for our halal guests even though this is not part of our standard menu. We are able to provide halal alternatives to some of our meats with prior notice, at no extra charge. We require 48 hours notice to ensure that we are able to source suitable products. Please note, although the meat itself will be halal, we cannot claim to operate a food preparation environment that follows halal guidelines. Our suppliers are all certified but we are not always sourced by the same supplier. Should you require any further details please do not hesitate to contact us. Let us know how you prefer your meat cooked; rare through to well done – we are happy to serve all our cuts to your taste. All our meats are served as soon as they are ready, in no particular order by our gaúcho chefs but please feel free to ask for your preferred cut to come out next. We welcome children of all ages and believe we provide a great atmosphere for families to enjoy the restaurant experience. In the evening if guests wish to make a reservation with children under the age of 8 please do so for no later than 6pm. When making a reservation please count children in the total number of guests and let us know if you need a high chair or space for a pram/pushchair. Fazenda’s dress code is “elegant smart casual”. We do not require gentlemen to wear jacket and tie, however, we do not permit sportswear or beachwear. Halal reservations must be made at least 48 hours in advance. All reservations confirmed by a deposit that are cancelled less than 3 days prior to the date of their booking will lose the deposit. The team at Fazenda take food safety very seriously and particularly so when it concerns allergens in food. It is very important for us that our industry supply this important information on the food we serve to our guests. On arrival we can provide our guests with a detailed list of allergen information upon request. In line with legislation passed in 2007 Fazenda is a no-smoking restaurant. We do not allow e-cigarettes inside either. Animals are not accepted unless assisting guests with disabilities.